In the previous article (https://guruparamparai.wordpress.com/2012/08/18/senai-mudhaliar/) we discussed about sEnai mudhaliAr. Now will move on to the next AchAryan in the OrAN vazhi guru paramparai. He is also known as mARan, sataGopan, parAngusan, vakuLAbharaNan, vakuLAbhirAman, magizhmAran, satajith, kurgUr nambi, etc. NammAzhwAr was born in ThirukkurugUr (AzhwAr thirunagari) as the child of KAri and udayanangai. He was born days after the advent of kaliyugam. In bhagavad gIthA, krishnan declares that “After many many birth one comes to the conclusion that everything belongs to vAsudevan (himself). And it is very rare to find such jnAnis”. NammAzhwAr from his life and works proves that he was one such jnAni who is very dear to emperumAn. Throughout his life (which only lasted 32 years in this samsAram), he stayed under the tamarind tree (thirupuLiyAzhwAr) and was always in yOgam (meditation) thinking about emperumAn. It is said in our pUrvAchArya vyAkyAnams that, the moment we hear kurugUr (generally in thiruvAimozhi pAsurams, the last pAsuram of each padhigam will have nammAzhwAr’s name and will generally be prefixed with kurugUr which is his avathAra sthalam), we should do an anjali towards the south direction (which is where AzhwAr thirungari is). NammAzhwAr is hailed as prapanna jana kUtasthar – i.e., the first one in the prapanna gOshti. He is also hailed as vaishnava kula pathi – the leader of the vaishnava fold by ALavandhAr. AlavandhAr in his sthOthra rathnam, 5th slOkam declares that he bows down at the lotus feet of vakUlAbhirAman who is everything (father, mother, child, wealth, etc) for him and his followers/descendants. emperumAnAr (who is himself an avathAram of AdhisEshan) is glorified as “mARan adi panNiNthu uyNthavan” (மாறன் அடி பணிந்து உய்ந்தவன்) meaning one who surrendered to nammAzhwAr and flourished. Other AzhwArs have also said the same thing in their works, that they were suffering in samsAram and are blessed by emperumAn with divine knowledge. nammAzhwAr’s prabhandhams are equal to 4 vEdhas. He is also known as “vEdham thamizh cheitha mAran” – one who gave the essence of samskrita vEdhas through his thamizh prabandhams. All the other AzhwArs prabhandhams are considered to be similar to the supplementary portion of vEdhas (like sIkshA, vyAkaraNam, etc). ThiruvAimozhi is glorified as the essence of all the 4000 divya prabandhams sung by AzhwArs. All our pUrvAchAryas works (vyAkyAnams and rahasya granthams) are based on the knowledge extracted from thiruvAimozhi. thiruvAimozhi itself has 5 vyAkyAnams and more detailed explanations in arumpadham. Our pUrvAchAryas establish that nammAzhwAr is considered to be having the qualities of many great personalities like srIdhEvi, bhUdhEvi, nILA dhEvi, goPikAs, lakshmaNan, bharathAzhwAn, sathrugnAzhwAn, dhasarathan, kousalyai, prahlAdhAzhwAn, vibhIshaNAzhwAn, hanuman, arjunan, etc. While nammAzhwAr has the qualities of every one of these personalities, they each only have some of the qualities of nammAzhwAr – such is his glories. In thiruvAimozhi 7.10.5 – palaradiyAr munbhrauLiya – nampiLLai beautifully brings out the thiruvuLLam of nammAzhwAr here. nammAzhwAr says in this pAsuram that emperumAn blessed him to sing thiruvAimozhi instead of great rishis like sri vEdhavyAsar, sri vAlmiki, sri parAsarar and mudhalAzhwArgaL who were expert in thamizh. nammAzhwAr who is considered as the avayavi (the whole) and other AzhwArs are considered as avayam (parts of him), appears in thirukkurugUr, on the banks of river thAmirabharaNi which is considered to be greater than all other rivers like gangA, yamunA, sarasvathi, etc. He appears as the son of kAri who is part of the prappanna kulam for many generations. These great personalities would not worship any one other than srIman nArAyaNan as explained by thirumazhisai AzhwAr as “maRaNthum puRam thozhA mANthar” (மறந்தும் புறம் தொழா மாந்தர்). There was one thiruvaLuthi vaLa nAdar, whose son is aRanthAngiyAr, whose son is chakrapANiyAr, whose son is achyuthar, whose son is chenthAmaraik kaNNar, whose son is poRkAriyAr, whose son is kAriyAr and whose son is nammAzhwAr. In this great vaishNava family, poRkAriyAr decides to look for a vaishnava girl for his son kAri to establish him in gruhasthAshramam and create vaishnava children for the upliftment of the entire world. poRkAri goes to thiruvaNparisAram dhivyadhEsam and meet thiruvAzhmArbhar (who is seeking to get her daughter married to a vaishnava and get vaishnava offsprings) and requests him to give her daughter udaiya nangai in wedding to kAriyAr. thiruvAzhmArbhar accepts and a grand wedding ceremony is conducted between kAriyAr and udaiyanangai. 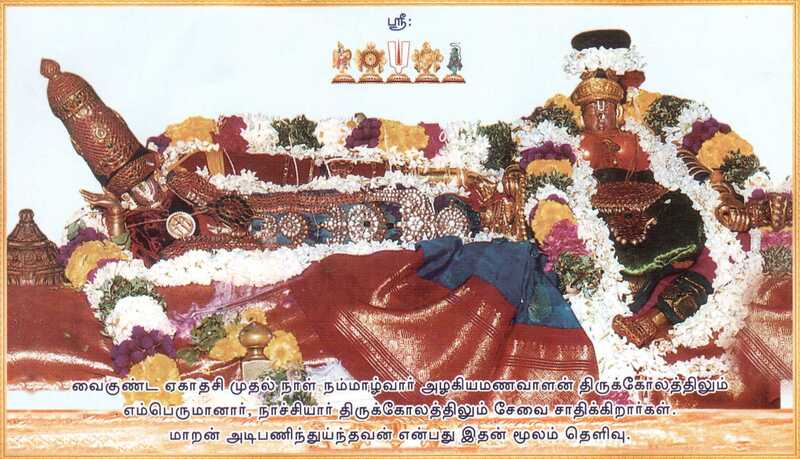 Both kAriyAr and udayanangai worship thiruvAzhmArbhan emperumAn in thiruvaNparisAram and returns to thirukkurugur. On their return, everyone in thirukkurugUr welcomed them with a great mood of devotion and celebration just like when srI rAman married sIthA pirAtti and brought her along to ayOdhyA from mithilA. 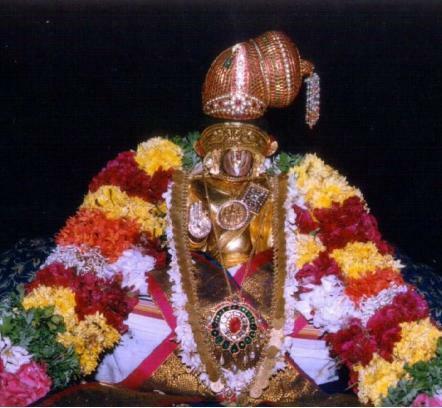 After some time, kAriyAr and udayanangai visit thiruvaNparisAram and on their way back, they visit thirukkurungudi and worship nambi emperumAn. They pray to him to have a child and nambi promises them that he himself will appear as their child. They return to thirukkurugur happily and after some time udaya nangai becomes pregnant. On the 43rd day after the dawn of kaliyugam, as per the orders of emperumAn, nammAzhwAr as he himself declares in “thirumAlAl aruLap peRRa chatagOpan” (திருமாலால் அருளப் பெற்ற சடகோபன்) meaning nammAzhwAr who was divinely blessed by srIman nArAyaNan, appears as an amsam of vishwaksEnar on bahudhAnya year (also said that it is pramAdhi year), vasantha ruthu (spring season), vaikAsi month, sukla paksham, paurNami thithi and thiruvisAka nakshathram. Similar to azhagiya maNavALa perumAL nAyanAr‘s declaration in his AchArya hrudhayam, here it is said that “Adhithya rAmadhivAkara achyutha bANukkaLukku NInGgAtha uLLiruL NInGgi chOshiyAtha piRavikkadal chOshiththu vikasiyAtha pOthil kamalam malarumpadi vakuLabUshanNa bAskarOdhayam unNdAyththu udaiyaNanGgaiyAgiRa pUrvasaNdhyaiyilE” (ஆதித்ய ராமதிவாகர அச்யுத பாநுக்களுக்கு நீங்காத உள்ளிருள் நீங்கி சோஷியாத பிறவிக்கடல் சோஷித்து விகஸியாத போதில் கமலம் மலரும்படி வகுளபூஷண பாஸ்கரோதயம் உண்டாய்த்து உடையநங்கையாகிற பூர்வஸந்த்யையிலே) meaning the inner ignorance of samsAris that was not removed by the appearance of the sun (Adhithya), srI rAman (rAma dhivAkara) who is glorified as a shining sun and krishNan (achyutha bAnu) who is also glorified as a shining sun, the ignorance was removed and the knowledge bloomed after the arrival of nammAzhwAr (vakuLA bhUshaNa bAskara) and this nammAzhwAr was conceived by udaiyanangai. AdhisEshan appears as the divine tamarind tree to protect AzhwAr (knowing that AzhwAr will take shelter in thirukkurugUr AthinAthan emperumAn’s temple). AzhwAr’s subsequent activities are described in madhurakavi AzhwAr’s charithram – https://guruparamparai.wordpress.com/2013/01/17/madhurakavi-azhwar/. His archAvathAra anubhavam is discussed in http://ponnadi.blogspot.in/2012/10/archavathara-anubhavam-nammazhwar.html. We will discuss about nAthamunigal’s life in the next article. This entry was posted in AzwhArs, OrAN vazhi guru paramparai on August 18, 2012 by sarathyt. Swami, is maasi vishakam the day on which Madhurakavigal installed Azhwar’s Archa Thirumeni? Or is it the day on which Thiruvaimozhippillai reinstalled Azhwar’s Archa Thirumeni? adiyen is not 100% sure. But adiyen would think that, it is the original prathishtA by madhurakavi AzhwAr.